During an informal moment in one of my last classes two semesters ago, a student asked me to give a critique on her generation. I found that quite interesting and for a few reasons. One, I see this generation as quite different from mine. Two, I worry at times about this generation, and I will explain why later. Three, I can’t help but feel somewhat responsible since it is my generation that brought and raised them in this world. To some extent, I compare my generation as parents of this present generation to the parents of Siddhartha Gautama (a.k.a. the Buddha). Even if eons separate us, we parents have one thing in common: we want to raise our kids without the “deprivation” that we experienced. In short, we want their lives to be as comfortable as possible. It is said that the Buddha’s father, who was a king, made sure that every pleasure, delight and convenience existing at the time was available in the palace so that his son Siddhartha would grow up without knowing pain, discomfort and suffering. He was shielded from all this. While we may not be as neurotic and protective as Siddhartha’s father, I can’t deny that we do shower our kids with the best we can afford and we try to spare them from a lot of the hardships we encountered when we were growing up. It is always interesting to my students when I talk about my experiences in college. Ateneo was not a coed university then. I was a junior when martial law was proclaimed. I lived through the dictatorship. I had classmates who joined the armed opposition and were killed in battle. I was also a scholar. When we wrote our term papers or theses, we used typewriters with about four sheets of carbon paper between pages of bond paper to make the required five copies we had to submit. And we had no word processors. We actually had to write our paragraphs on paper longhand before we typed them so that we were sure what we wanted to type, thus avoiding many mistakes, which were tedious and time-consuming to correct. We also used a curious gadget called a mimeograph machine. For sources, we actually had to borrow library books, and read and copy notes by hand. There was no Internet, no electronic cut and paste, no highlight and copy. It demanded greater personal and even mental discipline since we had to be more “linear” in the way we thought and presented our arguments. When my students hear this teacher talk about such things, they shake their heads in disbelief, probably wondering how we actually survived college life or even got educated. These days, they are quite free to dress the way they please, and they have their laptops open in the classroom, ready to check on links about the topics being discussed. I really do not know if they even feel the need to physically go to the library for any research when a lot of knowledge is literally at their fingertips, a few clicks away on their laptops or iPads. n my old-fashioned view, student life today is too convenient and non-challenging. On the first day of class, I like to tell the kids that I am there to teach students, not circus animals or dolphins. I gaze at their puzzled faces as I say this. I explain to them that there are too many students who try to figure out teachers for grade advantage more than to learn the lesson. In a way, they are like dolphins performing tricks to get applause. They appear to “know” the lessons using the words of the teacher when they recite or write their papers but they can hardly speak from experience. I like the word made flesh. I value feedback that has been thought out, distilled. Knowledge plus experience leads to wisdom, and so I ask my students to always speak from what they personally know to be true, instead of just repeating what they have read or what I have said. Of course, I do not expect much experience from them all the time, but I do appreciate the attempt to internalize knowledge and go deeper with it. Sometimes, I fear that this generation is too soft, too lax, too “protected” from much of the hardship and work that defined my generation’s school life. A parent I met recently shared her thoughts on the so-called “quarter-life crisis” that more and more young people seem to be experiencing today after they get out of college. She opined that a lot of that is simply delayed post-adolescence teenage blues that’s got a new psychological name and it’s not really a new syndrome. I don’t know. Is that what you get when you have been pampered and protected from much of the daily challenges of life? Did our fawning type of parenting make them narcissists, softies who “break” too easily? I must admit I don’t recall ever having a discussion on the issue of “self-esteem” at home or in school. There were also no conditions known as ADD or ADHD that a teacher had to deal with because they had not yet been identified. A student was either good or bad, disciplined or naughty. In a way, the lack of knowledge on the part of our teachers ensured that practically no student got special treatment. We learned to adjust to the rules and not seek exemption for whatever psychological or genetic disadvantage or reason that beset us. To be sure, there is both good and bad in every situation. I don’t doubt that teachers and psychologists through the years have learned a lot of new things that are now factors to consider in today’s parenting. I’m just not sure how much of it can really be considered as helpful. So when my student asked me to critique her generation, I voiced my generation’s usual lament: that they are too fragile, and yes, it’s our fault. I explained that as parents, we felt we were showing our love by giving our children every opportunity to develop their self-confidence and to achieve, while sparing them from the vicissitudes of life. It pained us to see our children suffer. I told her that our mistake was probably that we misunderstood that the relatively harder suffering our parents made us go through was in fact the gift that made us the generation that has achieved so much. Perhaps we should have passed on the same gifts to our children. But just as Siddhartha awakened to life as it was, despite the gilded cage his father had built for him, I know this generation will also catch on sooner or later. If ours was the gift that was passed on, theirs is the gift that they have yet to discover. If you have a DSLR and are using it like a point and shoot camera because you don’t know how to shoot outside of automatic mode, read on. I am offering a class for Basic Photography this Aug. 13 at 113 B. Gonzales, Loyola Heights, QC. Cost is P3,500. To reserve a slot, please e-mail me at jpfotojim@gmail.comor call 0916-8554303. On the 25th anniversary of The Philippine STAR, I would like to share 25 things that I personally experienced, believed to be true, or accepted as correct a quarter century ago, but which have since reached their expiry date. 1. Smoking did not cause cancer. For decades, this issue seemed to be on a perennial seesaw — true one day, not sure the next. Despite many cigarette company-sponsored “studies” by scientists through the years that said cigarettes were not carcinogenic, the issue has finally been settled. But why are so many people still smoking? 2. “Don’t trust anyone over 30.” This Jerry Rubin quote was something my generation believed in… well, sort of. Old people could not be trusted. Today, we have a situation where the media consider people in their late 20s to be “old” and 50- and 60-year-olds who used to believe Jerry Rubin consider themselves as anything but old. 3. Virginity could be “lost” only once. Today, there is the extreme makeover of virginity restoration that seems to be gaining traction in some parts of the world. Dr. Vicki Belo recently announced that she has acquired a machine that can “tighten” vaginal muscles. While it does not exactly restore virginity, her older clients may be able to sing Madonna’s Like a Virgin again. 4. Breaking the mandatory fast before receiving Communion was a mortal sin. When my mother was growing up, Catholics had to fast from midnight in order to receive Holy Communion the next day. Then the Church changed the fasting rule to only three hours before communion. Then it became one hour. Finally, they took out the fasting altogether. I’ve often wondered what has happened to the poor souls who took a light snack during the fasting period and still received Communion, and died without confessing this “mortal sin.” Do they now get a free ticket out of Hell? Strange are the ways of the Church! 5. Music was something we only listened to. I remember a Time magazine issue in the ‘80s on the MTV phenomenon where a boy was quoted asking, “Have you seen Michael Jackson’s new song?” People now “watch” music and for a ‘70s guy like me, this is disconcerting. Musicians in my generation made good music that did not need video support. Nowadays, a lot of awful music is considered “good” because of a great video, and good music can lose its appeal because of a bad video. Enter Dr. Spock with his ideas on rearing children that considered their physical, socio-psychological, mental, artistic, and kinetic intelligences which now had to be cultivated for the child’s full development. Everything seemed to change overnight. All of a sudden, spanking was taboo. Scolding could be considered “verbal abuse.” Whether one is “old school” or modern, one thing is sure: There has been a palpable “transfer of power” from parents to children, for better or for worse. 7. It took two to three weeks to send a letter to the US. When was the last time you used the post office to send a letter? Everything now happens in cyberspace and all in an instant. 8. “The Commodore 64 is the most modern computer today.” This was the claim of a computer engineer who worked for the company, and it was a valid claim — in 1982. In fact, the Commodore 64 outsold Apple, IBM, and other computer giants then. But does anybody still use a Commodore? If you own one, it could be a rare artifact in computer history that could be of value someday. 9. No black man could become president of the United States. How quickly many have forgotten how unlikely, in fact, how next to impossible it seemed that such a thing could happen just two decades ago. But Barack Obama was elected president in 2008, and may even get reelected in 2012. 10. “Ninoy Aquino is a communist.” So claimed Ferdinand Marcos who thereupon sent him to jail for seven years and seven months. The sycophant media trumpeted this as gospel truth when Marcos was the almighty and Ninoy was a powerless political detainee. Now, Ninoy is a national hero, and the old dictator is nowhere near having a decent place in history. 11. Boracay was a sleepy, rustic, unpopulated seaside town that few people knew about. The only thing true about this statement today is that Boracay is a seaside town. Voted number four in the list of best beach destinations in the world, it has become an overpopulated haven for sun worshippers from all over the world who have made it a mecca of fun and partying all year round. 12. Tagalog songs and movies were only for the “bakya” crowd, or the “masa.” In the ‘60s, only the poor and lower middle class went for Filipino songs and entertainment. The famous director Lamberto Avellana coined the term “bakya crowd” to describe his audience who wore cheap wooden clogs (bakya) in lieu of shoes. Today, OPM and local movies have a following that spans all the social classes. 13. EDSA was once a sleepy four-lane highway. I can still remember EDSA as a four-lane road that was not busy and of hardly any significance. It had stoplights on the corners of Ortigas, Shaw, New York, Aurora Boulevard, Buendia and other places. It had no flyovers, no elevated pedestrian crossings, no billboards, hardly any cops, and no MMDA. Today, it is the busiest, most populated road in the Philippines, full of functional and political significance. 14. Shoe Mart was a small retail store on Carriedo and later in Cubao that sold only shoes. Henry Sy, the owner of a small retail outlet called Shoe Mart, was a start-up businessman who personally served customers as they tried on shoes in his store. My aunt told us that Henry Sy himself attended to her when she bought a pair of shoes at the Shoe Mart store in Carriedo. Now, even the smallest SM outlet cannot, by any stretch of the imagination, be called a small retail shoe outlet. 15. Telephones were scarce and were exclusively landlines that you shared with a “party-line.” It is hard to believe that there was ever a time when there were no cell phones, when access to a telephone was shared by a nearby neighbor who, when they lifted the phone, could actually eavesdrop on your conversation. Today, the phone density in the Philippines is such that practically everyone has a personal cell phone. 16. For emergency news, or special events, people sent telegrams. You could even send a singing telegram on your girlfriend’s birthday. Do you know anyone who has received or sent a telegram in the last 10 years? Where do you even go to send one these days? 17. Men went to barbershops and women went to beauty parlors. When I was growing up, my brothers and I went for haircuts in those bastions of masculinity called barbershops where cutting hair was a pretty simple affair. The barber cut your hair and slapped that stingy lotion on your nape after. Now, we are pampered by a stylist in the same salons that women go to. 18. We went to a “sastre” or a tailor to have our clothes made. Most people went to a tailor for clothes that were made to order and fitted individually. If you knew were to look, you could also have shoes and boots made especially for you. Today, everything is off the rack. 19. The only things you could buy that were made in China were Mao caps, pins, and Little Red Books. And when you did, you had to hide them. Today, there is nothing you can buy anywhere in the world that is not made in China. 20. China was a communist state. Only the Chinese government still publicly espouses this now. While China is in no way democratic like the US, it is on its way to becoming the biggest capitalist country on earth. 21. Plaza Miranda in Manila was a symbol of democracy where people were free to express their ideas. “Can you defend that in Plaza Miranda?” politicians asked each other by way of a challenge. The vast open space in front of Quiapo Church made Plaza Miranda a perfect venue for political rallies and student demonstrations. Today, Plaza Miranda is simply too crowded with merchants and traffic and has lost its populist significance. 22. An impenetrable wall divided the city of Berlin, separating West Berlin from the rest of East Germany. I once crossed “Checkpoint Charlie,” the gate that divided Germany, going from democratic West Berlin to East Berlin and into communist East Germany. It was scary, mysterious, thrilling, and the memory of it still evokes the tensions of the Cold War. 23. The term or even the concept of “political correctness” did not exist. The first time it was used was in 1970 by Toni Cade who wrote in The Black Woman: “A man cannot be politically correct and a chauvinist too.” Today, political correctness has become the norm, a mode of behavior and speech that strives to make conversation about differences among people least offensive. 24. Local news on TV was delivered exclusively in English. In the ‘60s and ‘70s, every TV channel delivered the news in English. My favorite news show was The World Tonight with Angelo Castro and Tina Monzon-Palma. It was only in the ‘80s when news in the vernacular caught on, making it much more accessible to a wider population. 25. In the ‘60s, a girl was a “bird,” an apartment was a “pad,” and an event was a “happening.” These days, a girl is a “chick,” a “pad” could be an electronic device or even a feminine napkin. And to call anything a “happening” will expose your age. Learn everything about your DSLR and take great pictures. Join my Basic Photography Workshop on Aug. 13, 1 to 6:30 p.m. at 113 B. Gonzales, Loyola Heights, QC. Cost is P3,500. To reserve, call 0916-8554303, 426-5375 or e-mail jpfotojim@gmail.com. I was born a Catholic. I was ardently raised as one by my parents and my school. As a young boy and up to my early 20s, one might even say I was a prayerful person in the Catholic manner, with its rituals and its prescribed prayers. Compared to how I saw my classmates, I felt I was on the more scrupulous and conscientious side of things than most of them. I was never cavalier about how I treated people. I always thought of the repercussions and ramifications of actions I had done or had failed to do. I was also devoted to projects in school like the Christmas Package Drive where we solicited and brought goods and money from our parents and other benefactors to give to the poor so they could have a good Christmas. At night, I reflected on the day just past before I went to sleep. I thought of things I had done that were good or hurtful to others. I said the Act of Contrition nightly. I had a yearning to know God and His ways. I wanted to understand Him and know my mission in life. I took seriously our Catholic teachers’ talks about finding one’s purpose in this existence and following this for the greater glory of God. In short, I was a good Catholic boy. Being a student of the Jesuits was in many ways liberating. In high school, we were tackling moral questions like adults in theology class. I remember a Jesuit posing to us the idea of full knowledge and full consent in relation to so-called “mortal sins.” Could one possibly commit a so-called mortal sin with full knowledge and full consent? Can anyone in his right mind fathom the consequences of what eternal separation from God really is like and still commit mortal sin? What exactly did Jesus mean when He said, “Father, forgive them for they know not what they do”? Did Jesus realize that people in fact do not know or realize what they do? Are they being mortally sinful or just pridefully ignorant? But such discussions happened many moons ago. I am now in the very early autumn of my life. And while in a big way, my journey on this road of faith was shaped by the Jesuits, in other big ways, it was affected by those who spoke loudly for the Church — the Pope, the Bishops, the high-profile Catholic icons who represented the official church. And the contrasting voices and manners I heard led me to understand my own faith in the way that I do now. 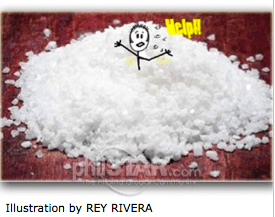 An influential Jesuit once told me that religion is like salt. One has to take it in moderation or things could go wrong. That made a lot of sense. I have largely resisted the pull of a lot of the faith renewal movements that have completely taken over the lives of many people I know. While it may work for them, the forever-striving-to-be-good, or wallowing in unworthiness is a turn-off. In place of an obsession with so-called Original Sin, I have learned to trust in my Original Blessing as a child of God. I have also realized that I am a person who questions things deeply before I give my heart, mind and soul to some eternal proposition that demands complete obedience and faithfulness in everyday life. I also trust in science and reason and I believe a true understanding of God is not anathema to them. I have not always sat comfortably with how the Church has conducted itself amid charges of pedophilia and corruption, and its refusal to cooperate with authorities in dealing with its erring rank and file. I have also questioned its stance on gays, reproductive health, and its continued acquisition of wealth, which, in my mind should be shared with the poor. The whole RH debate in the Philippines, the condom ban in Alabang and now the PCSO vehicles scandal has left my faith in the men who represent this great institution in tatters. I have been so disappointed in the way they have conducted themselves. I saw men of the cloth acting like politicians going for brownie points, and protecting their empires in place of charitable understanding and seeing good faith in their adversaries. I saw spin doctoring and even lying. I saw manipulation and hysterics in place of reasoning. In truth, my loyalty and belief in the institution is hanging by a thread. Ironically, it seems to me the Church is being destroyed not so much by those who profess to hate it, but by those who profess to love it. The admonition about too much salt also seems to apply to those who profess to be the salt of the earth. Moderation and tolerance, not fanaticism or quick condemnation, are the more winning ways. Thank God there are many wonderful priests, nuns and laity who mirror the face of Christ humbly without fanfare, and keep the flame burning for many. Some will question me when I say this, but a lot of wisdom one acquires through the years is learned by letting go of once immutable positions and beliefs. For the mind to evolve, one must be ready to outgrow it and be open to new things. And so it goes with faith. Faith is not trapped in musty centuries and old books of the past. God is there too but God continues to speak in the modern world and is not trapped in a time when the world was still seen to be flat, and non-Christians were still considered to be heathens. God is bigger than any religion, any era, any set of dogmas. Neither is God trapped in the literalism of words. God surpasses anything we can imagine and our understanding of Him must constantly evolve. Where before I found solace in quiet churches and the compassionate, charitable voices and teachings of our church leaders, I now also find it outside in Zen meditation, long walks, and mindfulness in everyday life. In truth, God seems to speak so clearly and so uncomplicatedly when I meet Him/Her there. In Zen, there is a saying that every blade of grass is as tall as a cathedral. I find no need for big religious productions and rituals where often self-serving homilies, religious dogma and positions get in the way. While I still go to Mass sometimes (mostly with Jesuits), I find I can now largely sustain my quest for the holy by just being as present as I can to ordinary things. Heaven used to be a place where I was not and to get there I had to live a life prescribed by some holy people as good, and then, just maybe, I could get there when I die. Now, I find that heaven is not a specific geographical place. In my experience, it is everywhere we are if we just open our eyes. It’s pretty hard to miss, even if we do. What remains true and uncomplicated for me are the simplest catechism tenets that I learned in grade school, and these are: a) God made everyone, b) God loves everybody unconditionally, and c) God is everywhere. From this I deduce that the God who made everyone also made gays and lesbians, sinners, and every marginalized person. And yes, God loves them as unconditionally as He/She does everyone else. And what is unconditional love? It is the love that knows no boundaries, and has no caveats. You do not have to do anything to deserve it. You already are deserving because you are God’s progeny. So throw away your fear. You can recover from anything and start anew, fresh and untainted. And for that alone, one is ennobled and inspired to do the right, conscientious thing. The way to holiness is good action without fear to goad you. The space for this article is too short for everything I want to say on the matter. I also know I have just tackled one of the most controversial, divisive topics of all time (the other being politics). I hope it was not naïve and foolish of me to do so. But I trust that in the most real way, all divisions including religious ones are illusionary. If I really open my eyes, I may see I have more things in common with the Pope, CBCP, the Alabang councilors, and all people whom I brand as “other” because of differences in opinions. But at the bottom of all things eternal, what do these mundane matters such as “dogma” mean? The world was once thought to be flat. Galileo used to be regarded as a heretic. Evolution was laughed at. Noli Me Tangere was on the list of banned books. Such things become inconsequential. Anything that has an expiry date is not eternally true. The eternal Oneness we share as God’s creatures shines brighter and outshines all the “small stuff” that isolates us from each other. Thank you for reading. Namaste. Gassho. Baba nam kevalam. Shalom. Peace and love. May the Lord be with you today and always. 113 B. Gonzales, Loyola Heights, QC. Cost is 3500Pesos. To reserve a slot, please email me at jpfotojim@gmail.comor call 09168554303. A woman loses her husband in a tragic accident. A little boy dies leaving his mother totally devastated. A family loses everything when fire hits their household. Something that you’ve wished and worked so hard for unexpectedly ends up in shambles. I am talking about dashed hopes and dreams, promises ending in tragic failure, destruction of all aspirations. These things happen all the time. Who is the man or woman who has lived long enough and who has not experienced great disappointment in life? There is the personal tragedy and the bigger one that affects entire communities and societies. Mankind has been through the world wars, famine, ethnic cleansing, 9/11, the Tokyo tsunami and the nuclear meltdown among many others that have brought mayhem and taken a great number of lives. Sometimes, the events are so unimaginable that it makes one question many of the basic things that one believes hold up the sky: life, God, the purpose of living, love, hope, trust, faith. One is left dumbfounded and shell-shocked with hardly anything to hold on to. How is it that life is okay one moment and eternally changed into something hideous and ugly in the next? How does one cope? How does one convince himself or herself that this is “okay” or tolerable, or that one can even recover from something so tragic? How does one begin to pick up the pieces?When tragedy strikes, one could fall into a spiral of hopelessness and despair that is so difficult to get out of. Some may even unknowingly “choose” to “live” down the spiral for a long period, perhaps for the rest of their lives. Where once they were happy and optimistic, dreaming of a bright future, they become bitter, cynical, depressed and depressing.But then there are those who do recover despite the odds. “Show me a hero and I will write you a tragedy,” said F. Scott Fitzgerald. He may as well have written the quote backwards as, “Show me a tragedy, and I will find you a hero.” Whatever the tides of fortune, there are those who will manage to surf the wave and find solace in tamer shores. In a way, surrendering to tragedy in hopelessness is like breaking your arm and not dealing with it by having it properly fixed. Eventually, much of the pain will go away but the arm will not heal normally. While there may be a semblance of recovery in the sense that the pain may recede, in truth, the fracture will become the new norm. The arm will be twisted, less pliant, less strong and less useful. It will need direct intervention to put the bones back in place, if it is still possible. Heroes are not alien to fear. Like everyone else, they feel the fear. The difference is, they do what needs to be done anyway. Facing fear starts like the tiny roar of a mouse against something much bigger. But what happens is, the defiance gains traction and strength as one moves deeper into the heart of fear and its darkness. The clash between the defiant challenger and fear itself becomes an even match until the fear is eventually overpowered. The big discovery here is that the fear when confronted is actually nowhere near the projection we give to it. It is a paper tiger. I believe that within every person lies a bigger, more powerful entity that one can muster when challenges appear. We are larger beings than we can ever imagine. Have we not seen unimaginable strength and even genius surface when it is most needed? During fires or floods, for example, people find that they can easily lift heavy objects by themselves without much effort or swim great distances against strong current. Haven’t we seen ordinary people come up often with brilliant solutions which were needed during crunch time? When one reviews history, in times of great crisis and turmoil, a hero often appears to answer the call of the times. Nature itself seems to show what I call an “optimism bias.” This term enters my mind every time I see, say, a burned forest sprouting new foliage, or Manila regaining much of its normalcy just a few days after a big storm. I also see it in people who recover from the death of a spouse or other loved ones and start dating again. Hope does spring eternal. Oscar Wilde said, “Behind every beauty that is exquisite was something tragic.” This implies a triumph over some ugliness, hopelessness and tragedy, and victory is the beauty he talks about. The art of living is all about turning the despicable and horrible into something beautiful. This is something artists are good at. Van Gogh, Picasso and many other artists led lives that many would call wretched and neurotic. And yet, from so much dysfunction came inspiring light and even transcendence. My favorite characters in history, fiction and real life are the rebels who question, who like to beat the odds, and who do not readily accept things as they are. These are people who, in their defiance, actually move the wheels of life into a progression they control. They are almost always optimistic and see opportunities where others see only bleakness. In the extreme dread of darkness when everyone is in despair, they reflect the faint flash of a star’s twinkle.